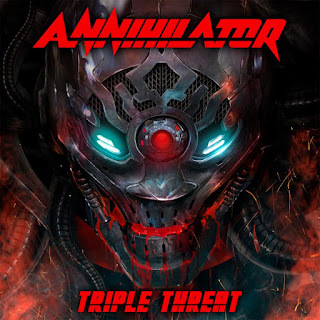 Jan. 27 marked the release of legendary Canadian thrash/heavy metal band ANNIHILATOR's "Triple Threat" - a three-disc collection of their music based in a trio of very different scenarios - out via UDR Music. Listen to a sample of the "Un-Plugged: The Watersound Studios Sessions" portion of the set here. "Triple Threat" is available now in several formats, including DVD/2CDs, Blu-Ray/2CDs, a 2CD audio-only and digital download. The main disc of "Triple Threat" comprises a set of ANNIHILATOR's classics performed acoustically, with band leader/guitarist/songwriter and vocalist Jeff Waters bringing together band members Aaron Homma and Rich Hinks, Vancouver, BC drummer and friend Marc LaFrance, plus Ottawa session player Pat Robillard. Recorded and mixed by Waters, this quintet recorded everything live, off the floor and in single takes at Watersound Studios in Dunrobin, Canada during late May and early June 2016, giving Waters one of the most challenging, satisfying and perhaps 'electric' creative moments in his career. The second disc features ANNIHILATOR's vicious set from the 2016 BANG YOUR HEAD Festival, a set which illustrates the very best of what ANNIHILATOR is known for - tight, sharp, technically-excellent and melodic thrash metal music. It also contains some exclusive inside-ANNIHILATOR off-stage perspective, which captures further elements, flavors and detail of the band which fans will flip over. Jeff Waters said, "This was one of the coolest things I have done in my long career. Having five people in a room, from all different backgrounds and talents, coming together to play songs from the past, and to try to sound like we are one but totally live and with feeling. This was one of the biggest challenges that ANNIHILATOR has faced, musically, but what impressed me the most was how you can hear all the individual styles each player has and how we were able to glue the playing and feel together. Done all in one take and with all the musical blemishes and imperfections that I would never normally let slide! For further information on ANNIHILATOR and "Triple Threat," please visit udr-music.com.